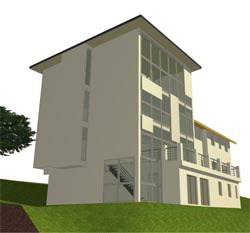 The design of passive or nearly passive houses can pose difficult problems to the architect. Especially in northern Europe this type of building design requires sometimes extreme scales of windows or heat storage masses that can not be estimated easily. Simulation. Our sophisticated simulation environment allows to accurately capture all aspects of heat generation, heat storage and air exchange. This enables very detailed planning strategies which utilize effects such as boyancy or the control of air exchange through staircases.